I can’t imagine anything more difficult for a YA author than penning a second novel when his or her first has been massively successful. 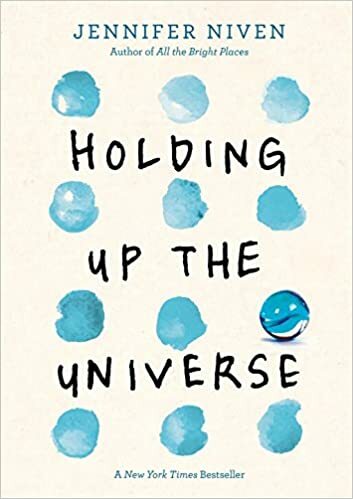 In Jennifer Niven’s case, Holding Up the Universe is another heart-breaking, important book, much like her first novel All the Bright Places. She continues to explore themes of pain and isolation in her teenage characters, but in Holding Up the Universe she imbues her central characters–Libby Strout and Jack Masselin–with rare characteristics to further that exploration. Libby was labeled “The World’s Fattest Teen” after she had to be cut out of her house when a panic attack stopped her breathing. She weighed over 600 pounds and could not stand on her own. After her mother’s sudden death, she attempted to fill the emptiness inside her with something tangible–food. In her worst moment, she realizes she has to change and develops healthier ways of dealing with her loss, losing some weight in the process. When Libby returns to school for her junior year, she becomes the target of cruel joke, one that binds her narrative to Jack Masselin’s. Jack has been living with prosopagnosia–“face blindness”–since a fall off the roof of his house at age six. No one knows. He’s developed coping mechanisms and a heady amount of swagger to avoid any sticky situations. But lately, his efforts have been failing. Once his stupid prank with Libby lands him in a special after school counseling group, he finds that she is the only person he can consistently recognize. Yes, she’s physically larger than everyone around her, but it’s something else, too. She’s magnetic. And their adventures together lead to a domino effect that changes everything for both of them. The idea of having these two off beat characters come together to challenge preconceived notions of what’s acceptable in society is a commendable idea, and I think Niven does an amazing job of it. I love that she forces readers to really consider why they might revile someone who is overweight. And Libby is unabashedly herself. A dancer. She honestly doesn’t care what people think of her weight, but the weight of people telling her she doesn’t matter, that she’s nothing, forces her into the painful position of having to wonder about the depth of people’s cruelty. Libby and Jack’s story is sweet and funny. I can imagine it could become an influential book for any young people who feel out of place. My only reservations are personal ones. This story did not crack my chest cavity open the way All the Bright Places did. But in all honesty, it was nice of Niven to leave off with a happy ending this time. Sounds like a book for my TBR list. Thanks.